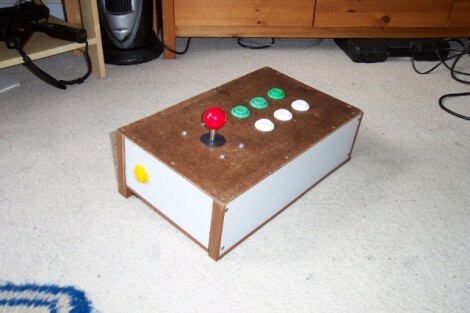 [Jamie] built his own USB connected arcade controller. We’ve been seeing a lot of these lately, and they usually involve soldering buttons to a keyboard PCB. 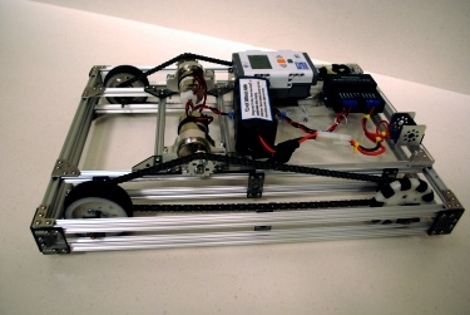 But [Jamie] decided to go a different route and use his own microcontroller. This method always gets a bit hairy when it comes to deciding how to connect it to a computer. Dealing with the USB stack used to be quite tricky, but the LUFA project is slowly taking the pain out of the process. The Lightweight USB Framework for AVRs is an open source project that handles the hard work associated with USB capable AVR microcontrollers. [Jamie] knew that they already had a sample implementation of a hardware joystick. He’s not using one of the supported boards and so wasn’t able to just compile and go. But porting the code to work with his minimus board was simple enough. With the code in place, the physical build was quite simple. 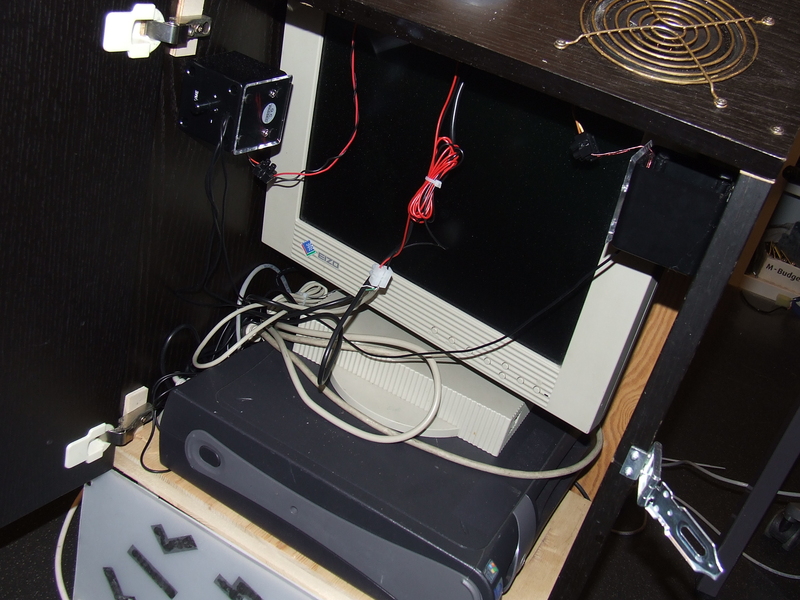 The buttons and joystick were mounted on the surface of an overturned drawer. Each is connected to one pin of the controller board and to ground. LUFA makes sure that the device enumerates as a joystick, and [Jamie] was gaming in no time. 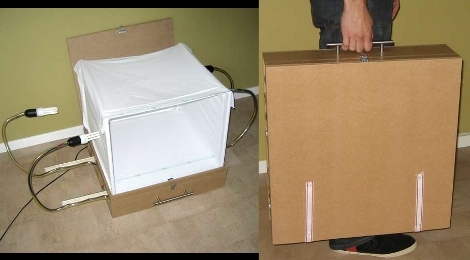 Looking to make a quality light box more portable, [Hharry] designed a collapsible version complete with adjustable side lighting. Light tents are used by photographers as a stage for photographing small items. The use of multiple light sources, and a fabric that will diffuse them, means a reduction in shadows that might otherwise ruin a picture. This design starts with an MDF base in the form of a shallow box with a few baffles running left to right. Drawer slides connect the lamp poles to these baffles, making it easy to pull each of the four light sources out when setting up the tent. The white fabric that makes up the stage has pockets sewn into the edges to accept dowel rods. These are not anchored permanently. They pull against the fabric when wedged in place to keep the tent taut, but easily fold down for storage in the cavities of the base. Finally, the top of the carrying case folds down and a drawer pull serves as the carrying handle. A light tent isn’t the only way to battle shadows in your pictures. Check out this method that uses mirrors to adjust lighting conditions. 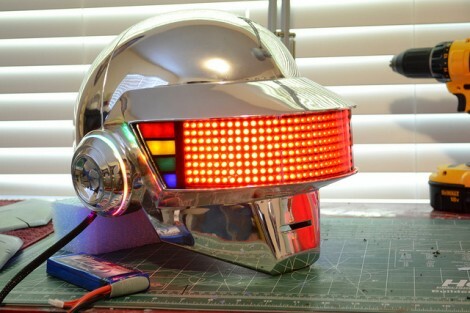 This Daft Punk helmet replica is beautiful to look at, but the deeper we delve into the build process, the more we begin to think that the entire project is a piece of artwork. 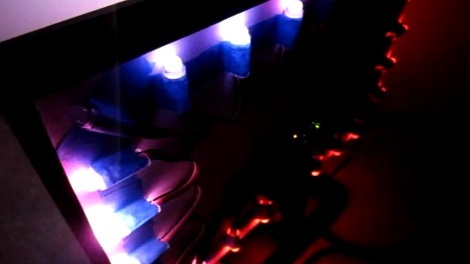 [Harrison Krix] has been working on it for months, and just posted his three-part build log in September. Check out the video and the links to all three parts after the break. Now [Harrison] isn’t new to prop replica scene. He’s the guy responsible for the other fantastic Daft Punk helmet we saw last year. He’s tapped the same fabrication skills to churn out an equally impressive chromed helmet, complete with addressable flashing LEDs. He built his own mold to create the body of the helmet, reminding us of the Storm Trooper helmet replicas we saw in July. While this was off being coated in chrome, he got down to business with the electronics. The visor of the helmet has a red LED marquee. This, along with the multicolored visor sides and ear pucks, is controlled by an Arduino yellow jacket. The lights can be controlled by an iPhone app that connects to the helmet via WiFi, letting a user push custom messages to the display, and alter the light patterns. The build shines on the inside as well as the outside with an incredibly clean LED matrix build, and clever control placement for switching each part on or off. A few months back, [Phil] was looking to get into PIC development, but he couldn’t seem to find a simple development board for the PIC16F883 microcontroller he wanted to use. 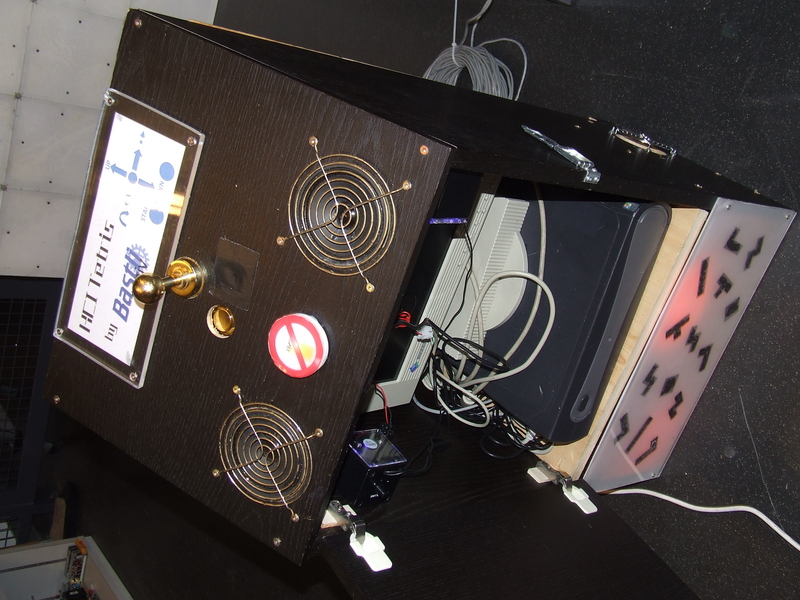 Since no retail offering had exactly what he was looking for, he decided to put together a dev board of his own. He spent a couple hours in Eagle, putting together a simple board layout. 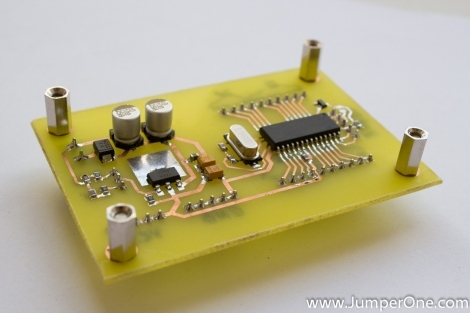 [Phil] then busted out the iron and copper clad, making his dev board a reality using the tried and true toner transfer method. He says that the board itself is quite simple, consisting of little more than the PIC, an LM1117 linear voltage regulator, and all the pin headers you could possibly need. While very basic and not necessarily a hack, we do like seeing people make their own tools when the market doesn’t provide what they want. If you have been looking around for a simple PIC development solution, be sure to swing by [Phil’s] site – all of the schematics and layout files are free for the taking.